The main difference between Religious and Non Religious Weddings is that the latter is conducted by a Celebrant, not a Priest or Minister, and there is no mention of God, prayers or the like. Instead, the ceremony focuses on what lies at the heart of your relationship and future marriage: your true love and all the experiences that helped bring the two of you together and decide to spend the rest of your lives together as husband and wife. 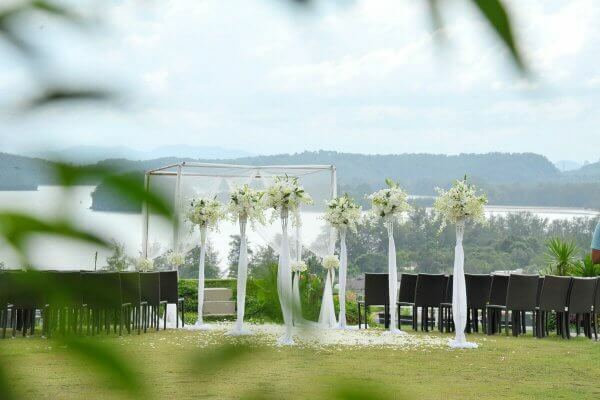 So is the choice of venues: hilltop with mesmerizing ocean views – there is no shortage of picture perfect backdrops for your Non Religious Symbolic Wedding in Thailand. And we conduct weddings in or nearby all the major tourist destinations here, as well as out-of-the way places, so basically we go where you go! Venue floral decorations , aisle set-up and flower arch. Short Description: Your wedding day is one of the most specials days in your life and at Thailand Wedding Company we sincerely believe that it should be made special to your specific preferences and the dream you have in mind.